The models currently used to examine the behavior transportation systems are usually modespecific. That is, they focus on a single mode (i.e. railways, highways, or waterways). The lack of integration limits the usefulness of models to analyze the intermodal movement of freight. This project developed a GIS-based model of the three primary surface modes as well as intermodal connections. 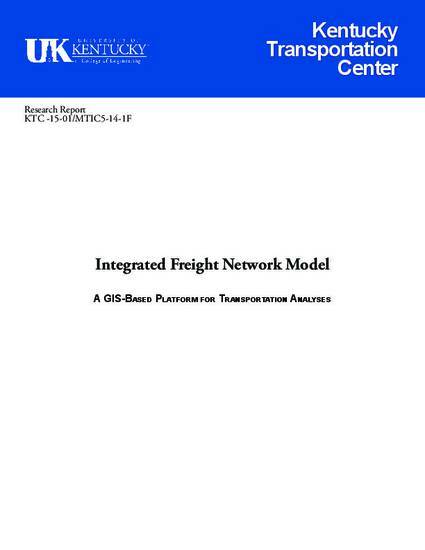 The resulting Integrated Freight Network Model (IFNM) accommodates highly detailed about shipping costs, transfer costs, traffic volumes (including non-freight auto traffic), and network interconnectivity properties. As a proof of concept, the research team conducted an exploratory analysis that asked what the potential impact would be to Kentucky highways if approximately half of the freight currently transported by barges on the Ohio River were shifted onto trucks. Coal-haul roads in the northeastern and western part of Kentucky would be particularly hard hit by a broad scale modal shift. The IFNM highlighted that roads emanating from the Western Coalfields would experience explosive growth in freight transport, with the proportion of trucks relative to overall traffic significantly increasing. Applying the IFNM to a range of freight-related transportation questions could greatly enhance system efficiencies and positively impact local economies and environments. The contents of this report reflect the views of the authors, who are responsible for the facts and the accuracy of the information presented herein. This document is disseminated under the sponsorship of the U.S. Department of Transportation’s University Transportation Centers Program, in the interest of information exchange. The U.S. Government assumes no liability for the contents or use thereof.